Before we can describe all the new features of WebLogic 12.1.3 & 12.1.4 and compare this to the 12.1.2 version we should first take a look at the 10.3.6 version. WebLogic 10.3.6 is still the latest 11g version but Oracle will support 10.3.6 till 2018 and extended support till 2021. So Oracle’s Fusion Apps and we have enough time to migrate to WebLogic 12.1.X. Oracle also promised that the upgrade should be easy. That being said we can take look at the WebLogic 12.1.X features. 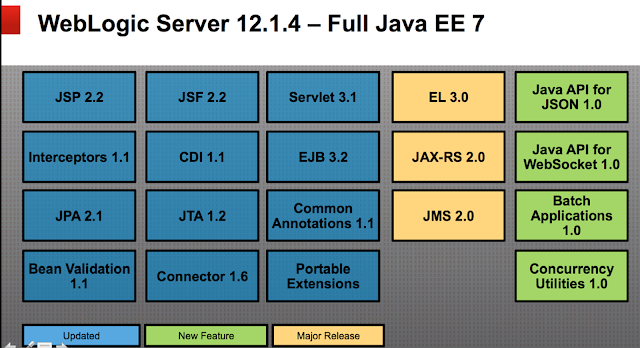 Last summer Oracle already released WebLogic 12.1.2 which has since WebLogic 12.1.1 been certified for Java EE 6 and it looks like the Java EE 7 certification is still far away, so Oracle updated the 12.1.2 version with some badly needed frameworks like WebSockets. To make the developer experience more complete Oracle added more support for Maven and it comes with a utility to synchronize a Maven repository with all the needed WebLogic libraries. 12.1.2 is also the first release, which comes with Fusion Middleware infrastructure components. For now FMW 12.1.2 contains ADF & OWSM and comes with Enterprise Manager & MDS. WebLogic 12.1.2 replaced the BEA installer and the BSU patching utilities with the Oracle Universal Installer and the OPatch utilities for applying patches. To make it even more easier it just comes in one taste ( no Java included or a specific Operating System installer ). Just one big jar file for WebLogic with Coherence or one for WebLogic, Coherence and FMW. WebLogic 12.1.2 introduced Dynamic Clusters, Elastic JMS and integrated Coherence configuration and management. Dynamic Clusters is a great feature to extend the WebLogic Cluster with Managed Servers based on a Server Template. For this we only need to change a parameter on the cluster and the new Managed Servers are distributed over the NodeManagers. To use this feature your blades need to have enough free resources to handle the extra Managed Servers. Elastic JMS can be combined with Dynamic Clusters, this way we only need to create 1 JMS server, target this to the cluster and every Cluster node will have its own JMS server. 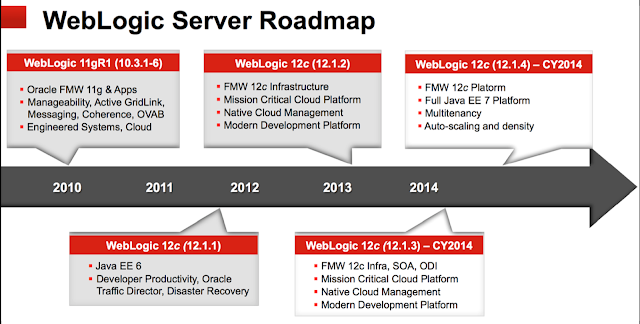 When we look at the announced features of WebLogic 12.1.3 and 12.1.4 we can see that Oracle continues on this road. WebLogic 12.1.3 will be the first version for many FMW 12c products like Oracle SOA Suite 12c and probably come in one big jar. 12.1.3 & 12.1.4 will add extra features and improvements to Elastic JMS & Dynamic Clusters. Elastic JMS in 12.1.3 will support Server Migration so you can’t lose any JMS messages. In 12.1.4, Dynamic Clusters will have support for auto-scaling based on thresholds based on user-defined metrics. WebLogic 12.1.4 will also have an API to control the Dynamic Clusters, this way we can easily program when to stop, start or remove nodes from a dynamic cluster. 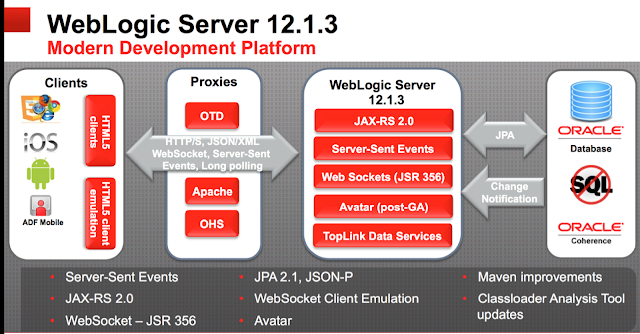 WebLogic 12.1.3 will come with the JDBC 12c driver, this driver will gives us better integration and reliability between WebLogic 12c and Oracle Database 12c (Application Continuity). When we take a look at the administration side of WebLogic we can see that the Enterprise Manager will be more important, in WebLogic 12.1.3 we can also do Application and JMS administration from the EM application. Also 12.1.3 will contain a Restful management APIs for additional monitoring, operations, Datasource and deployment support. Plus a global OWSM policy to protect all your Web and Rest services with one server policy. 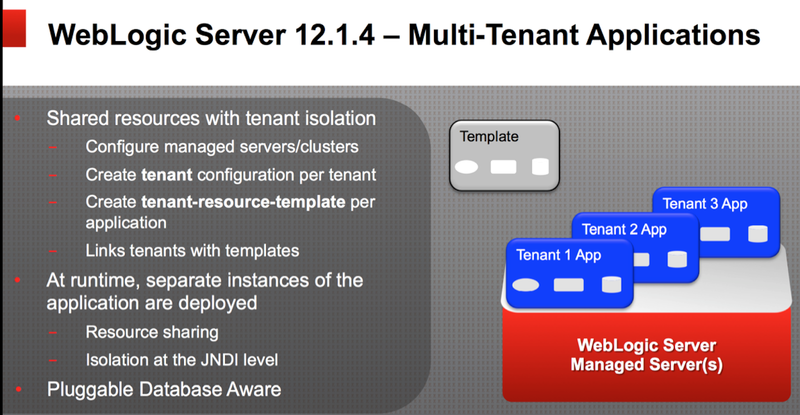 WebLogic 12.1.4 will have a new feature called Multi-Tenant Applications, this way you can define an WebLogic template for an application, so one or more customers of this application which will have its own Cluster, Managed Servers, Application and (not shared) resources plus it will support Oracle Database 12c pluggable databases. The last part of this article will talk about the development side of WebLogic 12.1.3 and 12.1.4. First WebLogic 12.1.3 has to be the Modern Development Platform and will focus on HTML5 development. • Updated version of JAX-RS and WebSockets. • Server-Sent Events, this allows you to continuously sending updates to the browsers. • JSON-P or JSON with Padding will solve your cross domain security problems. The last question is off course when can we expect WebLogic 12.1.3 & 12.1.4. The 12.1.3 version will probably be released in March or April and 12.1.4 will be much later.